home News Hospital microbiome studies might want to start including hospital kitchens ..
Hospital microbiome studies might want to start including hospital kitchens ..
A Threat from the Kitchen” Sarah Tschudin-Sutter, MD, MSc; Reno Frei, MD; Roger Stephan, DVM; Herbert Hachler, PhD; Danica Nogarth; Andreas F. Widmer, MD, MSc. Infect Control Hosp Epidemiol 2014: 35(5): 581-584. I posted it to our Mendeley collection just now. I’d be curious to know your opinion after you have read the article. Interestingly, from 154 cutting boards sampled, only 10 (6.5%) were positive for ESBL-producing E. coli. No ESBL-producing enterobacterial species other than E. coli were detected. Of the 144 cutting boards sampled from different sites in the community, only 5/144 (3.4%) were contaminated. The authors noted several limitations of their study including the fact that cutting boards were assessed in only one hospital. They also pointed out a possible bias attributable to the potentially more “standardized” collection of samples in the hospital by only one person compared with the collection of samples in private households in three different European countries. I wonder whether this potential sample collection bias could also affect so-called “citizen science” projects where householders collect the samples? I also wonder whether cutting boards are more contaminated than countertops, especially the grout between ceramic tiles. As grout ages and its surface deteriorates through aggressive cleaning, it becomes increasingly rough creating environmental “niches” where microbes can dwell and await arrival of sufficient moisture for replication and evolution. 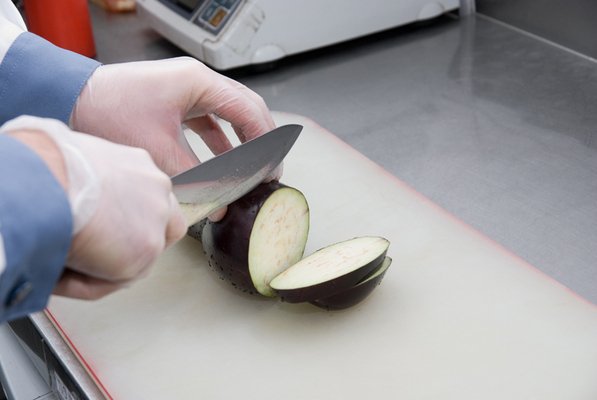 What is the impact of the products we use to clean our countertops and cutting boards on these processes? The contamination found was associated with poultry processing, never from meat processing. This highlights the importance of the impact of human behavior (e.g., dietary choices) on (microbial) exposures in the indoor environment. Even more fascinating to me is that while the prevalance of ESBL-producing E. coli is unknown but believed to be increasing worldwide, is that increase attributable to increased consumption of poultry rather the beef or pork meat, increased use of antibiotics in the meat and poultry production industries, or other human-behavior-dependent factors? Our behaviors are important determinants of our exposures in the indoor environment, but behavior is a relatively neglected focus for exposure studies in the indoor environment research community.